Now, after being spotted at CTIA, the G2x really had nowhere else to hide, so T-Mobile decided to finally officially unveil it to the public. As expected, the G2x sports a dual-core 1GHz Tegra 2 processor with a 4" capacitive display, an 8GB ROM, an 8MP rear camera with 1080P video recording, a 1.3MP front-facing camera, DLNA capabilities, and the stock version of Android 2.2 (!). 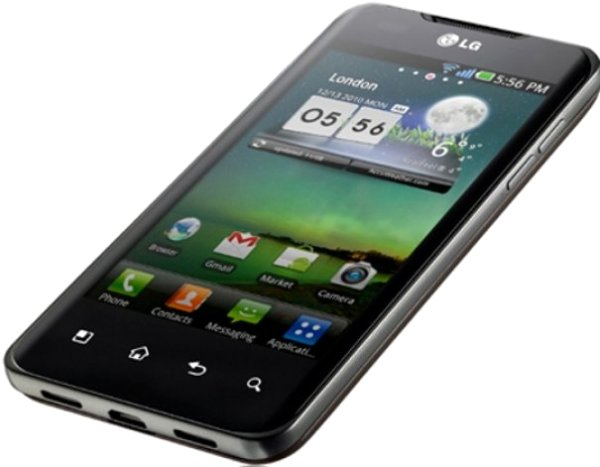 Yeah, this phone is sweet. The G2x is expected this Spring, and while the official press release doesn't narrow down this date, TmoNews seems to think that April 20th sounds probable. With AT&T's recent acquisition of T-Mobile and talks of having to eventually replace all T-Mobile spectrum phones with AT&T's, you may feel cautious about buying anything T-Mobile branded, but there really is nothing to fear at this time - if the deal goes through, it will take over 2 years for the final details to fall in place, giving you ample time to upgrade to an AT&T device. The G2x seems like a very fair choice on the T-Mobile network at this point. BELLEVUE, Wash. and SAN DIEGO — March 22, 2011 — T-Mobile USA, Inc. and LG Mobile Phones (LG) today announced the upcoming availability of the T-Mobile® G2x™ with Google™ by LG. The latest 4G smartphone to join T-Mobile’s exclusive line of G-series devices, the G2x is made for speed and mobile entertainment, with built-in support for 4G speeds on America’s Largest 4G Network™, an NVIDIA Tegra 2 mobile processor with dual-core CPU, brilliant 4-inch capacitive touch screen display and preloaded content, such as Need For Speed™ SHIFT HD. Need for Speed™ SHIFT HD, developed by Electronic Arts (EA), is an award-winning, authentic racing game that combines the true driver’s experience with real-world physics, pixel-perfect car models, and a wide range of authentic race tracks. DTS Ultra Mobile™, which includes two innovative audio technologies – DTS Envelo™ and DTS Boost™ – for a premium surround sound experience. When listening to music or playing games on the T-Mobile G2x, customers will enjoy rich, enhanced sound that adds depth, dimension and volume levels that are robust without distortion. A demo of Near Orbit Vanguard Alliance - N.O.V.A., developed by Gameloft, is a fast-paced sci-fi action game in which players operate as Kal Wardin, an elite soldier established to protect humanity from alien threats. T-Mobile TV, offering live and on-demand TV including news, sports and full-length entertainment, plus full episodes of your favorite shows. Zinio eReader, the largest online newsstand, enabling customers to shop for, search inside, read, share and save digital content in new ways with more than 75,000 digital magazines from 26 countries. T-Mobile Video Chat powered by Qik™, enabling video conversations with friends and family through T-Mobile’s network and Wi-Fi. Developed by graphics powerhouse NVIDIA, each CPU in the Tegra 2 processor runs at a speed of 1GHz and boasts low power consumption and high performance for playing video and audio. Combined with T-Mobile’s lightning-fast 4G network, the G2x delivers a fast Web browsing experience, smooth game play, instantaneous touch response and seamless multitasking between applications for a compelling mobile entertainment experience. In addition, the G2x will include NVIDIA’s Tegra Zone application, which provides quick access to games optimized for the Tegra 2’s dual-core architecture, which is built to handle the performance requirements of mobile games that use PC and console quality graphics features. The G2x comes equipped with an 8-megapixel rear-facing camera with LED flash and autofocus, and a front-facing 1.3-megapixel camera paired with the preloaded T-Mobile Video Chat application powered by Qik for staying in touch with family and friends. With the phone’s 1080p high-definition (HD) video recorder and DLNA compatibility, G2x customers can capture video and wirelessly connect to a compatible HD TV or other DLNA device for streaming full HD video content or enjoying a console-like gaming experience through HDMI mirroring, taking advantage of the phone’s accelerometer and gyro sensor. 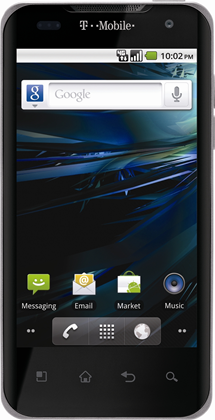 Powered by a stock version of the Android™ 2.2 operating system, the G2x offers access to more than 150,000 applications available on Android Market™ and integration with Google services such as Google Voice™, Voice Actions™ from Google, Google Goggles™, Google Search™, Gmail™, Google Maps™ with Places and Navigation, YouTube™, Google Talk™, Google Earth™ and more. The G2x features smartphone essentials such as easy access to personal and work e-mail, including support for Microsoft® Exchange e-mail, contacts and calendar, social networking, and instant messaging. The G2x also includes Swype® for easy text input, 8GB of internal memory with a microSD card slot with support for expandable memory up to 32GB, Stereo Bluetooth® 2.1, built-in 3.5mm headphone jack, Adobe® Flash® Player support and a music player. The T-Mobile G2x with Google is expected to be available nationwide later this spring at T-Mobile retail stores and online at http://www.t-mobile.com.